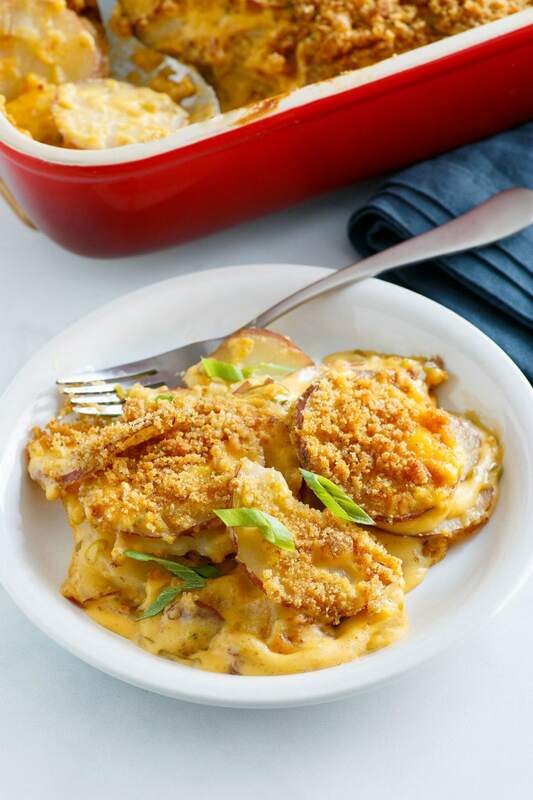 These Cheesy Scalloped Potatoes are my favorite scalloped potatoes recipe of all time. 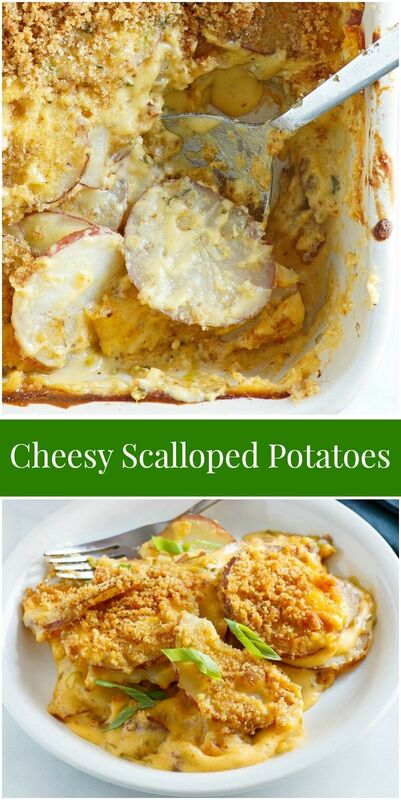 I have shared quite a few scalloped potato recipes here on RecipeGirl, but these Cheesy Scalloped Potatoes are truly the most delicious. Maybe it’s because of the cheese. 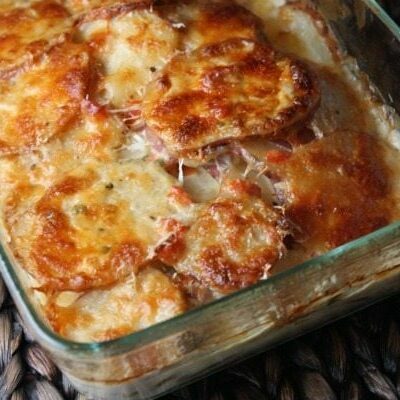 I do love a good cheese sauce mixed with my scalloped potatoes (and we have one here). 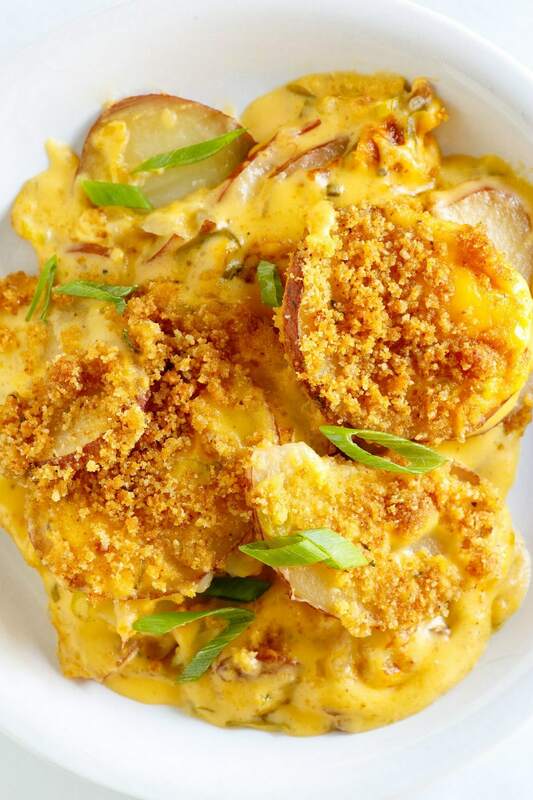 The buttery breadcrumb topping is a good addition too. It’s simply the best. You can tell from the photos that this recipe is generous with the sauce. That’s a very good thing. 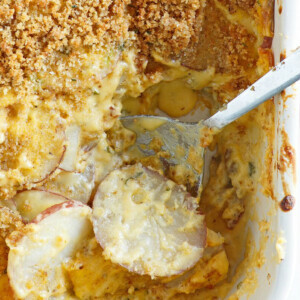 No one wants any dry potatoes in their scalloped potatoes dish! This recipe calls for red potatoes, and you don’t need to bother in removing the skin. I kind of like seeing the hint of red potato skin in the dish. They’re just a little bit pretty. I think it’s safe to say that this is a pretty decadent side dish. 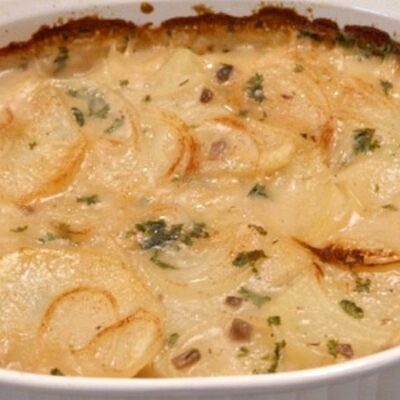 I love to serve scalloped potatoes with filet mignon, roasted chicken or beef or pork. 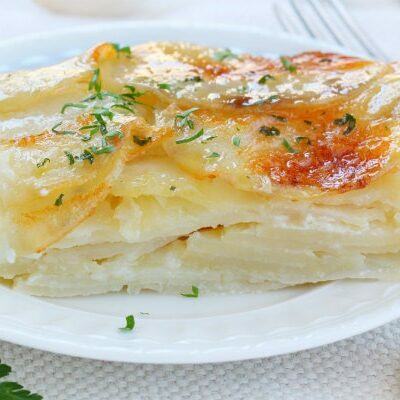 And if you’re serving it as a dish to share with visiting guests, you better believe they will be excited to see that scalloped potatoes are on the menu. They’re always a popular favorite! If you’re looking for main dishes to serve with these potatoes, you might like to try my Filet Mignon with Marsala Caramelized Onions or this Rosemary Pork Roast. Prime Rib Roast, Cider Roasted Chicken and this Crockpot Roast Beef Dinner are delicious main dish recipes too. This potato recipe makes a nice side dish for roasts and other meats. Melt the butter in a large sauté pan over medium heat. Whisk in the flour, and cook (stirring constantly) 3 minutes, or until the flour is lightly browned. Whisk the milk into the sauté pan and bring to a boil (continue to watch closely and stir). Reduce the heat and simmer for 5 minutes or until thickened. Stir in the shredded cheese, onions, salt and pepper. Stir until the cheese melts. 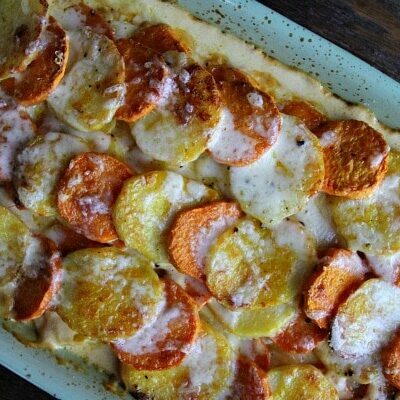 Preheat the oven to 325 degrees F. Spray a 13 x 9-inch baking dish with nonstick spray. Spread 1/4 cup of the cheese mixture evenly in the dish. Layer half of the potatoes in the dish and top with about half of the remaining sauce. Place another layer of potatoes and spread the rest of the sauce on top. Bake, covered, for 2 hours. 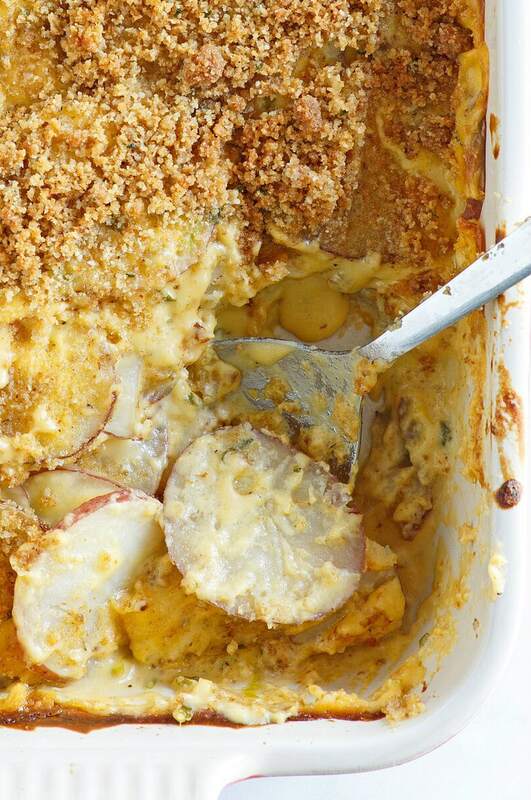 In a medium bowl, combine the breadcrumbs, butter and Parmesan. Sprinkle evenly over the cooked potatoes. Bake uncovered for 20 minutes more, or until the breadcrumbs are browned and the potatoes are tender. 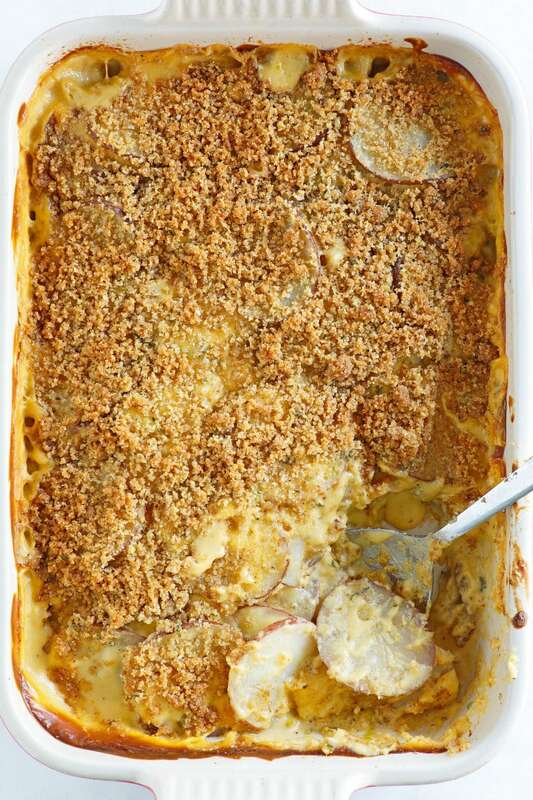 *If you anticipate a larger crowd: use a larger baking dish, add a few more potatoes and increase amounts for the cheese sauce. This recipe was first shared in 2007. It was edited and re-published in 2018. This needs to happen in my house very soon! This recipe sounds wonderful. What would you suggest adjusting the cooking time to if I cut this recipe in half and baked it in an 8×8 baking dish? Hi Sharon, I really don’t know since I haven’t done it that way. Probably reduce baking time a bit, but it’s hard to pinpoint how much without experimenting! I LOVE the crumb topping on top! I ate these a lot growing up. love it! I love the crispy topping on these!